First 2012 Show a Success! The passion for horses, the ability to communicate, and the love of teaching make Christy the trainer she is. With more than 20 years of riding experience, she has ridden in a variety of barns from hunter/jumper to western pleasure, even spending a few years working as a therapeutic riding instructor. Her attention to detail and desire to understand the “why’s” and “how’s” of riding lead her to find her calling in dressage. To Christy, one of the best parts of dressage (and the ultimate test of correct work) is watching horses change over time. 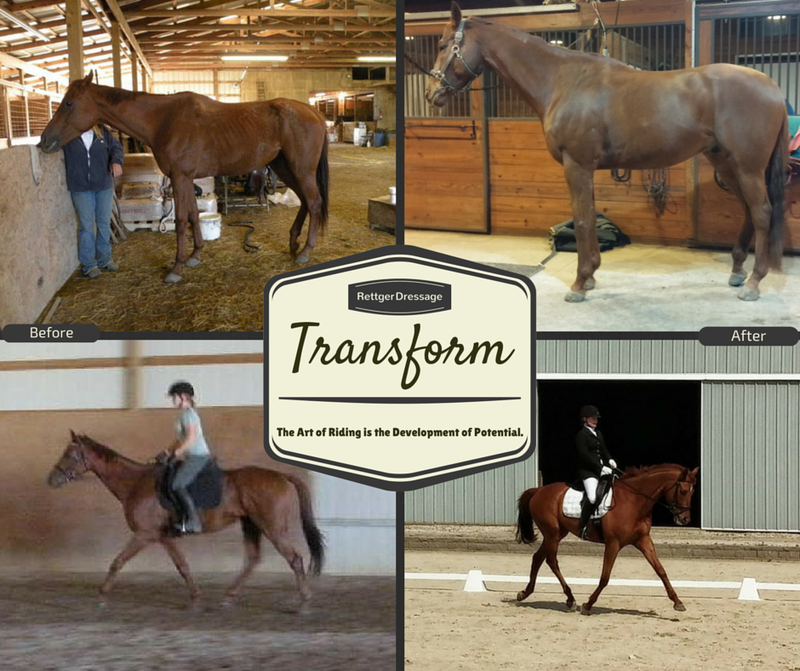 She loves a good transformation, and has successfully achieved some pretty spectacular ones! With time and patience, and a heart that listens to the horse’s needs, she molds them into their best potential. The horse pictured below she got off the track as a rather sad looking 4 year old, and 4 years later he’s schooling tempi changes, pirouettes, and half steps! To achieve this, she is always learning. She studies diligently everything she can get her hands on, from books to online articles to research papers. She’s keenly interested in every aspect of training a horse, even beyond the in-the-saddle training part. 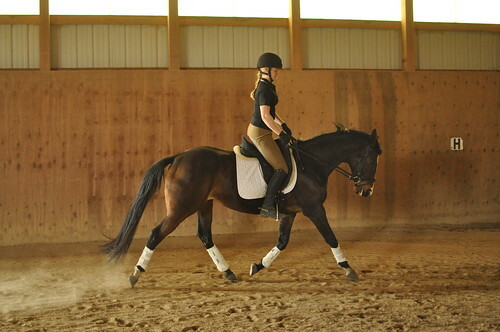 She has studied in depth the way different kinds of bits work, saddle fitting, and how correct rider biomechanics makes for almost effortless invisible aids. Due to the time and conscientious effort she puts into her research, she’s very aware of the pieces that need to come together to create one of her transformations, and is able to apply the pieces as necessary to help other horses and riders discovering what they are missing. This understanding has lead her to work with ex-racehorses. 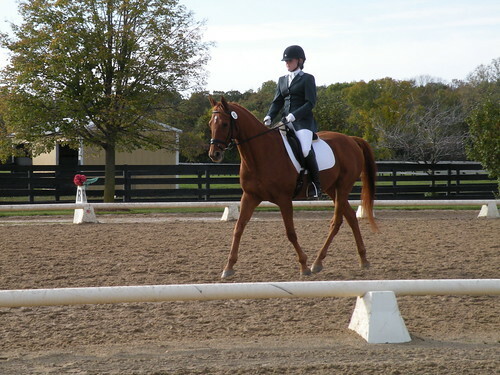 She enjoys helping them transition from racetrack life to new careers, and believes a the correct dressage foundation she is able to give them will help them in their future careers, regardless of which discipline they are best suited for. The inspiration for this work came from her first horse, Liam, who she still has (and still competes!) more than a decade after she rescued him from a meat-truck future after his long racing career came to an end. At that time, vets believed he’d never be sound enough for any sort of future and suggested euthanasia, but fate had something else in mind for the pair. Liam became a journey and an education, as well as a deep friendship, that demonstrates the values that guide Christy’s work with horses. To get to this level, she previously spent 14 months as a working student for Julie Julian, a USDF bronze, silver, and gold medalist who has trained multiple horses and riders to FEI levels. She takes lessons and participates in clinics when she has the opportunity, and has enjoyed riding with trainers such as Robert Dover, Pam Goodrich and Elizabeth Poulin. 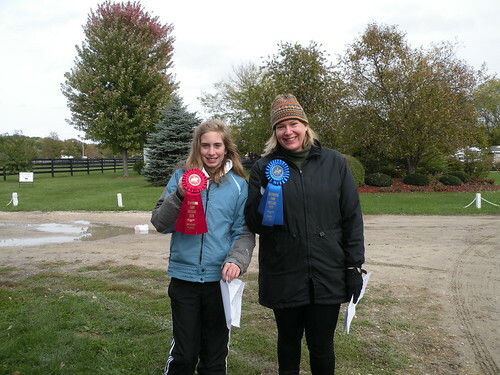 Christy balances her in-the-saddle education with a literary education, which she believes helps her to put the feelings she wants to convey to her students into words, allowing her to explain the same thing in different ways to adapt to her students’ learning styles. She believes understanding the theory and biomechanics behind the training is important for both the rider and the horse’s education. She favors a classical approach over a win-at-any-cost approach, but studies the works from different traditions to broaden her understanding. Beyond enjoying studying dressage, rider biomechanics, and horse health and physiology, Christy also draws on her background in psychology and sociology (she has a B.S. from U of I in both fields) to help her communicate effectively with her students. With an awareness of the different learning styles and how psychological states effect learning and performance, Christy is able to help guide her students to get the most from their lessons by working with whatever they bring to the table on a given day. She also completed the EAGALA (Equine Assisted Growth and Learning Association) training course, which blends psychotherapy with horses, and she still finds much of what she learned useful in helping her students understand their relationships with their horses, and helping them to understand how often times their horses act as a mirror. Harmony and partnership with the horse are the goals she works towards with her students, regardless of their level of experience. She believes riding should be fun, for both horse and rider, and when a solid foundation is built upon slowly and correctly, success is inevitable.